This weekend we met the loveliest woman named Monika Knutsson. Originally from Sweden, Monika now lives in New York with her husband who is a professor at Columbia University. After a very interesting career path (which included working for Isabel Marant) she has now embarked on jewellery design. Not just any old jewelery. 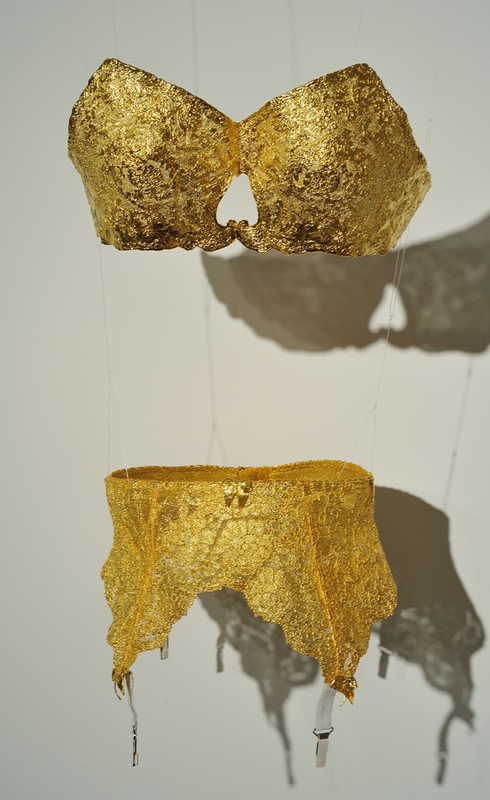 She searches sources all over the world for the finest antique lace and turns them into gold. Monika lived in Paris for nine years. This is where her love affair with lace began. She searched the flea markets and brocantes for lace. Eventually she amassed a collection including pieces from France, England, Switzerland, Austria, Belgium, Germany, and Sweden. She then trained for a year to master the art of gilding in order to create these incredible works of art. 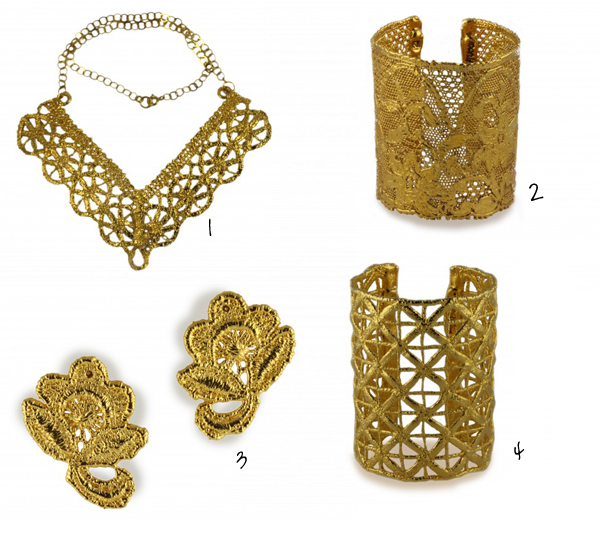 Not only does she create jewellery, but beautiful sculptural tabletop creations and objects to hang on walls as well. The detail is amazing, and the pieces are very delicate and beautiful. Monika can do custom work where she often makes pieces for brides from their mother's veils or from the a detail from their dresses. This is a great way to preserve a dress that would otherwise sit in an attic and never be worn again. Monika's creations can be seen at Fragments and American Two Shot, both in Soho. 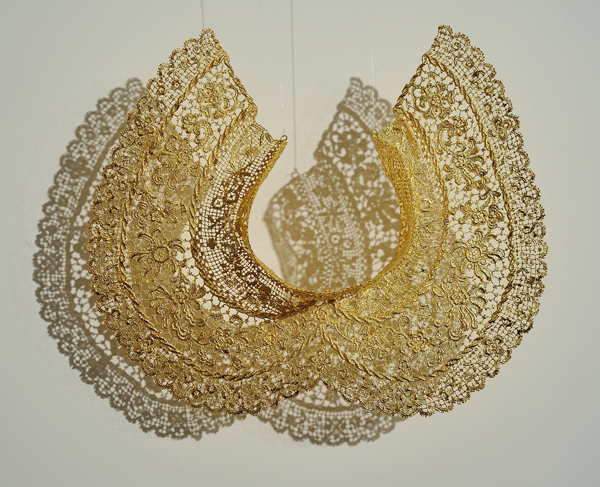 You may enjoy this little video by the Swedish newspaper Nordstjernan on a Gilded Lace exhibit at Charles Bank Gallery in Soho. You can also go straight to her website here to see her jewelery. Here are some of our favorites. Here are some of her spectacular sculptural creations that, at the same time, provide the most delicate and wonderful shadows you can imagine. Ernestine corset bra and the Erneste Girdle made from 1930's Calais lace. These can be worn! Eliza French Collar. It is made from Guipure lace from the early 1900s. Jean et Louis Table Lamp. 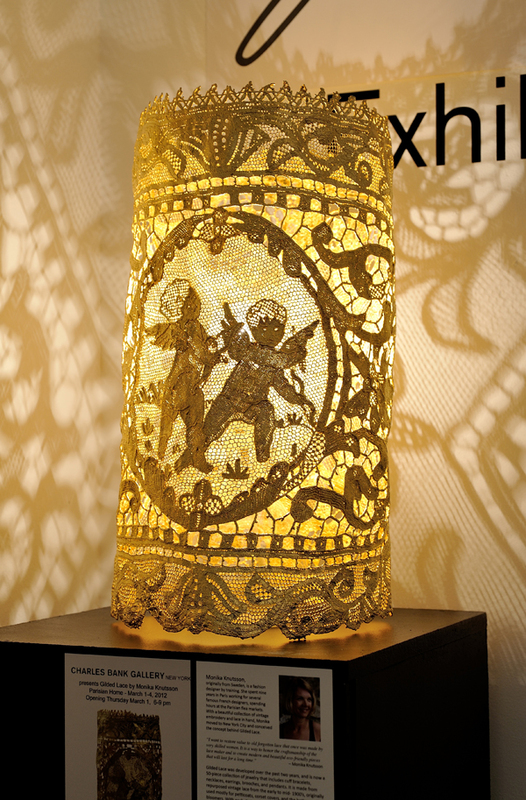 ethereal lamp is made from 1890s hand-embroidered laces- Luxeuil, Venice and Puy-en-Velay bobbin lace. Isn't everything so delicate and romantic? Visit her website here for more of these treasures. Don't forget to join the Fashion For Home give away. It ends today!! !